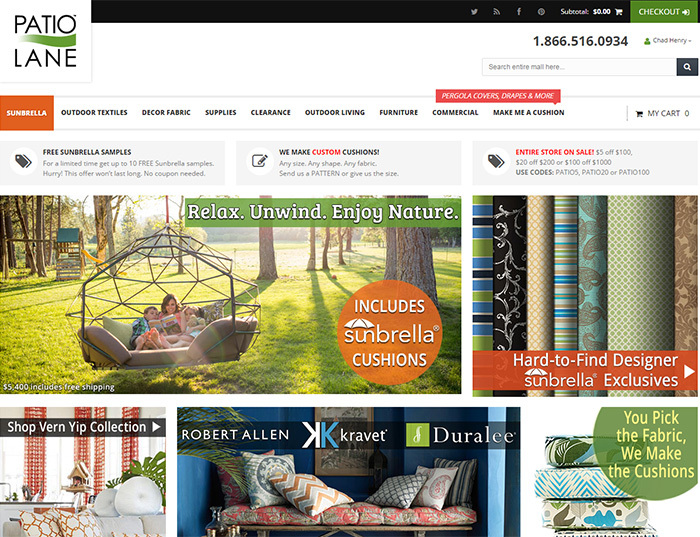 Indoors and outdoors, Sunbrella© fabrics are versatile. Whether you need fabric for your awning, outdoor furniture or umbrella, the Bimini on your boat or your casual furniture in your home, Sunbrella© fabrics can go anywhere. Sunbrella© fabrics are tough enough to withstand the extremes of Mother Nature along with all the little accidents that come from everyday living. 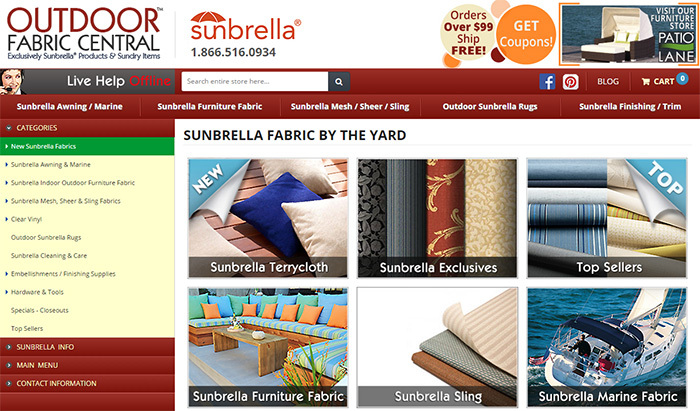 Sunbrella fabrics will remain beautiful summer after summer. 1,000s of outdoor performance fabrics and textile supplies that cater to the awning, marine, automotive and contract/hospitality industries. In addition, we feature interior décor fabrics, outdoor living products such as rugs and heaters, custom cushion and finished goods manufacturing and dozens of awning and shade solutions to help complete any outdoor space. 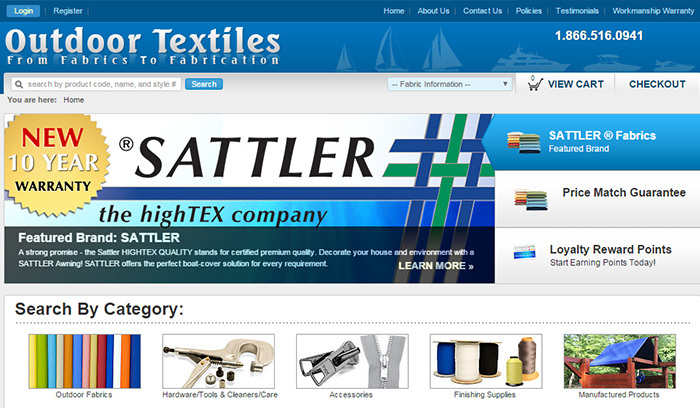 Our products include furniture fabrics, marine fabrics of all kinds, clear vinyl, grommets, zippers, and threads. Our selection includes such name brands as Ferrari, Nautolex, Sunbrella, Outdura, TopGun, Strataglass, Stamoid, and others. As a family-owned firm, we know what consistency is all about. We know what a difference quality can make. And we know that a smile, a handshake, and a purchase that feels really good will guarantee our success. Therefore, we're committed to three main features. 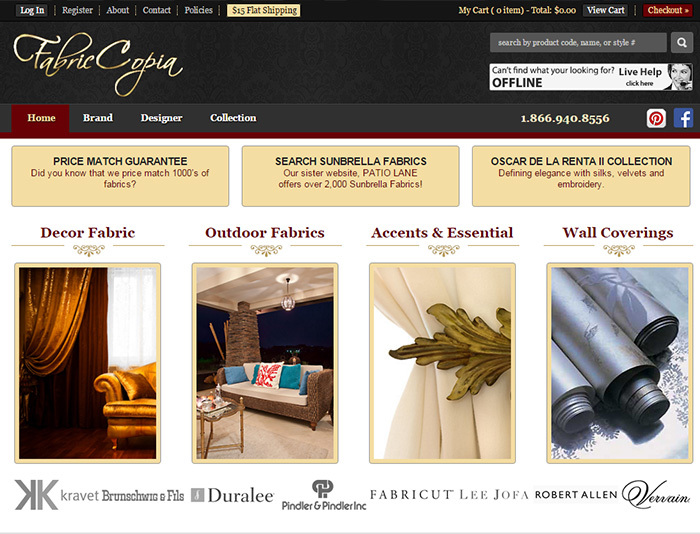 To provide interior designers and consumers an extensive online listing of luxurious interior designer fabrics, including those used for yachting and hospitality commercial applications. Additionally, we strive to provide our customers with a positive shopping experience with our easy to use website and superior customer service.